South Asia, notably the vast Indo–Gangetic plains (IGP), is one of the most heavily populated and most polluted regions of the world, and it is getting worse, for example, the region has been projected to have the worst ozone pollution in the world by 2030. The region is directly upwind of vulnerable ecosystems in the Himalayan-Tibetan region, one of the least sampled regions of the globe. Recent field experiments and modeling studies focused on northern South Asia have demonstrated that human activities have had dramatic impacts on atmospheric chemistry and physics in this region, with important implications for air quality, human health, agriculture, the cryosphere, and climate in the broader region. In order to characterize the air pollutant emissions, ambient distributions, atmospheric processes, and potential impacts in this region, the Institute for Advanced Sustainability Studies (IASS), Potsdam, Germany, and the International Centre for Integrated Mountain Development (ICIMOD), Kathmandu, Nepal, led the SusKat-ABC (Sustainable Atmosphere for the Kathmandu Valley – atmospheric brown cloud) international air pollution measurement campaign during December 2012–June 2013 in Nepal. In the course of this campaign, high-quality atmospheric data were collected at six sites (including one supersite) in the highly polluted Kathmandu Valley as well as at six sites in the surrounding regions, including the northern part of the IGP, the Himalayan foothills, and the base of Mt. Everest. With the participation of over 40 scientists from 18 research groups in 9 countries, SusKat-ABC was the second largest international air pollution measurement campaign ever conducted in South Asia (after INDOEX in 1999), and it provides detailed air pollution data for the first time for the Himalayan foothills. The campaign was endorsed by the UNEP’s Project ABC (atmospheric brown cloud). Key features of the measurements include the first deployment of a proton transfer reaction time-of-flight mass spectrometry (PTR-ToF-MS) in South Asia for the speciated measurement of ambient volatile organic compounds (VOCs), a 3-year time series of black carbon (BC) monitored with the new generation Aethalometer AE33 (the only such time series worldwide acquired with an AE33 in a highly polluted environment), an isotopic analysis of elemental carbon (EC) and organic carbon (OC) and quantification of BC and brown carbon (BrC), seasonal variations of several air pollutants at multiple sites, particle-bound polycyclic aromatic hydrocarbons (PAHs) at six sites across the Himalayan foothills, as well as a detailed analysis of the interplay between meteorology and emissions in determining ambient air pollution concentrations in the Kathmandu Valley. This special issue will highlight the field studies carried out under the SusKat-ABC field campaign and associated modeling investigations. These studies address scientific questions on the emissions, atmospheric distributions, and atmospheric chemical composition, processing, regional trans-boundary transport, and impacts of air pollutants, for example, on air quality, human health, weather, the cryosphere, and climate in the IGP and Himalayan regions. Furthermore, this special issue is open to the submission of closely related manuscripts that are generally focused on these topics relating to IGP-Himalayan-Tibetan region. The findings of the papers in this special issue are expected to be of a great interest to the international scientific community, policy and decision makers, and the general public alike. The sources of primary and secondary aerosols in the Hindu Kush–Himalayan–Tibetan Plateau region are not well known. Organic molecular tracers are useful for aerosol source apportionment. The characterization of molecular tracers were first systemically investigated and the contribution from primary and secondary sources to carbonaceous aerosols was estimated in the Kathmandu Valley. Our results demonstrate that biomass burning contributed a significant fraction to OC in the Kathmandu Valley. Black carbon (BC) aerosol in the Tibetan Plateau (TP) has important effects on the regional climate and hydrological processes in South and East Asia. 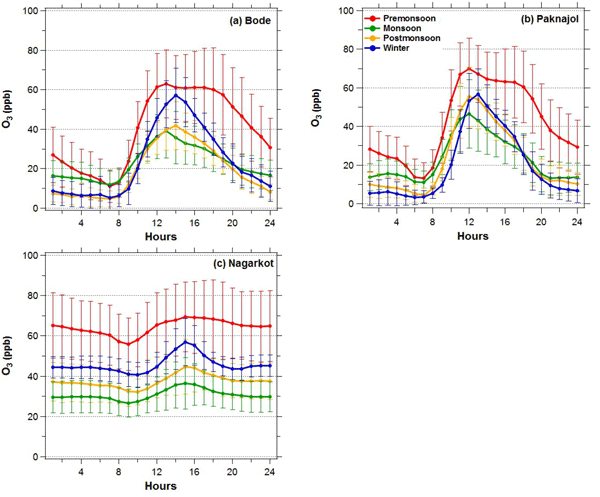 We characterized BC at a high-altitude remote site in the southeastern Tibetan Plateau using a single-particle soot photometer and a photoacoustic extinctiometer. Our study provides insight into the sources and evolution of BC aerosol on the TP, and the results will be useful for improving models of the radiative effects in this area. We analyze seasonal and diurnal concentrations of black carbon (BC), ozone, and associated meteorological conditions within a remote trans-Himalayan valley in western Nepal. We observe elevated BC concentrations during non-monsoon seasons, frequent and persistent episodes of higher-than-average concentrations, and net up-valley fluxes throughout the year. The findings provide direct observational evidence of trans-Himalayan valleys serving as vital pollutant transport pathways. We investigated the optical and chemical properties and direct radiative effects of aerosols in the Kathmandu Valley. We concluded that the ratio of light-absorbing to scattering aerosols as well as the concentration of light-absorbing aerosols is much higher at Kathmandu than other comparable regions, and it contributes to a great atmospheric absorption efficiency. This study provides unprecedented insights into aerosol optical properties and their radiative forcings in the Kathmandu Valley. The paper provides an overview of CH4, CO2, and CO mixing ratios, including diurnal and seasonal variation, and discusses the association of potential sources and meteorology with the observed temporal variation in the Kathmandu Valley. The study will provide an important dataset for a poorly studied region and will be useful for validating estimates from emission inventories, regional models, and satellite observations and assisting in the design of mitigation measures in the region. In this study, we found, due to contribution of carbonates, previously reported BC concentration in atmosphere of the Himalayas and Tibetan Plateau (HTP) were overestimated by around 39–52 %. Meanwhile, we found BC deposition of lake cores overestimated the atmospheric deposition of BC in the HTP; BC depositions of glacier region reflected actual values of 17.9 ± 5.3 mg m−2 a−1. The above results are critical for studying atmospheric distribution and chemical transport of BC in and around the HTP. For the first time, atmospheric composition was monitored during pre-monsoon season of 2013 at Lumbini (UNESCO world heritage site as birthplace of the Buddha). PM and O3 frequently exceeded WHO guidelines. Pollution concentration, diurnal characteristics and influence of open burning on air quality in Lumbini were investigated. Potential source regions were also identified. Results show that air pollution at this site is of a great concern, requiring prompt attention for mitigation. 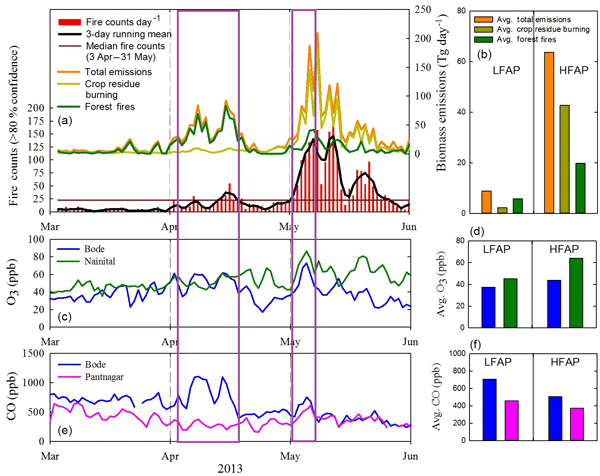 Biomass burning (BB) tracers in the aerosols in Lumbini, northern IGP, were studied for the first time. The levoglucosan was the predominant tracer and BB significantly contributed to the air quality in Lumbini. Mixed crop residues and hardwood were main burning materials. BB emissions constituted large fraction of OC, especially during the post-monsoon season. 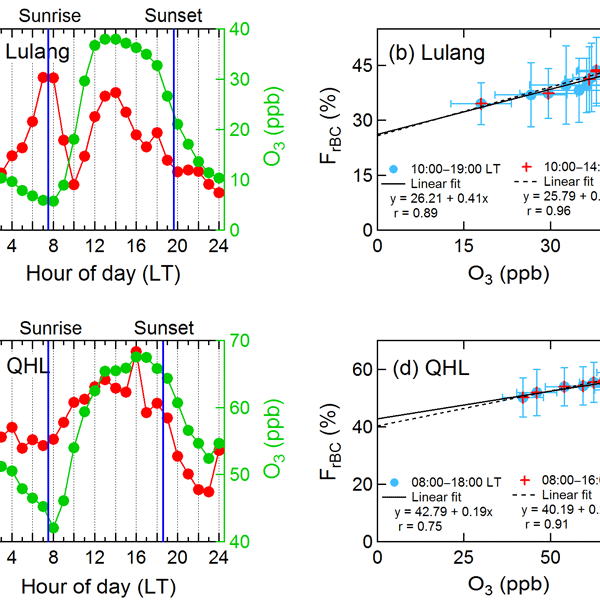 The sources of BB aerosols in Lumbini varies seasonally due to the influence of local emissions and long-range transport. Ceilometer measurements taken in the Kathmandu Valley, Nepal, were used to study the temporal and spatial evolution of the mixing layer height in the valley. This provides important information on the vertical structure of the atmosphere and can thus also help to understand the mixing of air pollutants (e.g. black carbon) in the valley. The seasonal and diurnal cycles of the mixing layer were found to be highly dependent on meteorology and mainly anticorrelated to black carbon concentrations. This study provides quantitative information regarding the source contributions of the major non-methane volatile organic compound sources in the Kathmandu Valley. Combining high-resolution in situ NMVOC data and model analyses, we show that REAS v2.1 and EDGAR v4.2 emission inventories underestimate the contribution of traffic and do not take the contribution of brick kilns into account. Furthermore, REAS v2.1 overestimates the contribution of residential biofuel use and industries. Particulate matter levels were monitored at six major roadway intersections in the Kathmandu Valley during two seasons in 2014. The study documented distinct seasonal (dry season versus wet season) and diel variations in particulate matter levels. This study suggests traffic-related emissions, and soil–dust–construction materials were found to be a major source of particulate matter at these locations. 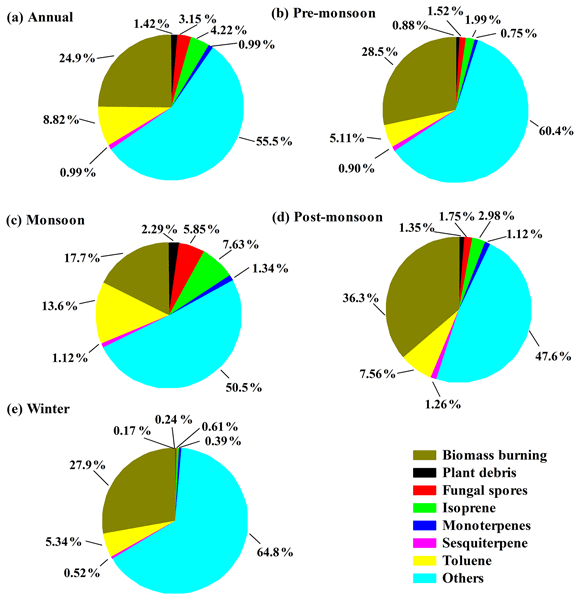 We present the first, or rare, field measurements in South Asia of emission factors for up to 80 gases (pollutants, greenhouse gases, and precursors) and black carbon and aerosol optical properties at 405 and 870 nm for many previously under-sampled sources that are important in developing countries such as cooking with dung and wood, garbage and crop residue burning, brick kilns, motorcycles, generators and pumps, etc. Brown carbon contributes significantly to total aerosol absorption. First deployment of PTR-TOF-MS in South Asia. High acetaldehyde and biogenic isoprene concentrations detected even in winter in the Kathmandu Valley. Isocyanic acid, formamide, acetamide, naphthalene and nitromethane were detected for the first time in South Asian air. Oxygenated VOCs and isoprene-dominated OH reactivity and ozone production potentials (> 68 % OPP). Regulation of emissions from biomass co-fired brick kilns' by cleaner technology would improve air quality of the valley. The aim of this paper is to present a full year analysis of simultaneous measurements of ozone, black carbon and aerosol number concentration at Paknajol, in the Kathmandu Valley, one of the global “hot spots” in terms of air pollution. Results indicate persisting poor air quality conditions throughout all the measurement period, and suggest that the pollutants variability is mainly driven by local pollution sources activity, local and large-scale dynamics, photochemistry and vegetation fires.